The Baldwin High School girls wrestling team edged Kamehameha Kapalama by half a point for the Bears’ first-ever state team crown at the Texaco State Wrestling Championships at the Blaisdell Arena in Honolulu on Thursday night. The Bears scored 157.5 points, Kapalama had 157 and Lahainaluna was third with 148. The Bears rode individual crowns from Jahnea Miguel at 145 pounds and Waipuilani Estrella-Beauchamp at 127. Miguel won the first final of the night and, in the Bears’ last championship match, Estrella-Beauchamp scored six team points with a pin. “Every single ounce of sweat, tears and energy — we needed it all, man, that was crazy,” Baldwin coach Malakai Panuve said via phone. “It was everybody. We brought the girls together, we looked at the team points, we looked at who we had. The Maui Interscholastic League crowned seven state champions — including a trio of Estrellas — to claim a quarter of the state titles on the line. In the boys team chase, Leilehua edged Kamehameha Kapalama 156-155 for the championship. Lahainaluna was third with 148 and Baldwin was eighth with 84.5. As the final Bear to take the mat, Estrella-Beauchamp pinned Kamehameha Kapalama’s Alexis Nova Posiulai at 1 minute, 36 seconds in the only head-to-head championship match between the top two schools in the team standings. Miguel jumpstarted things for the Bears in the first final of the day when she beat top seed Sadie Antoque of Castle 7-3. Miguel, a sophomore who won the 127-pound final last year, bypassed the 138 weight class two weeks ago to help the Bears win the MIL team title for the first time in 10 years. Siera Vida of Baldwin takes on Roxie Umu of Kealakehe in the girls 184 final. Umu won 6-0. Lahainaluna’s Ira Navarro, the state champion last year at 97, beat Hawaii Baptist’s Kaitlin Ito 7-5 in the 102 final. Lahainaluna’s Nanea Estrella won her second state title with a pin in 5:29 of Punahou’s Marisa Iha in the 122 championship match. Estrella, the 117 state champion last year as a freshman, led 14-1 before recording the pin with 31 seconds left in the match. Kainalu Estrella of Lahainaluna takes on Kaua Nishigaya of Iolani on Thursday. It was her brother Kainalu’s state crown moments later that made the night for Nanea, a cousin of Estrella-Beauchamp. In the 107 girls final, Lahainaluna’s Sami Saribay beat Roosevelt’s Haylee Fujioka 5-3 in overtime. Saribay scored a takedown 25 seconds into the first sudden-death extra period to claim the title. Roxie Umu of Kealakehe beat Baldwin’s Siera Vida 6-0 in the girls 184 final. Kahuku’s Tangiteina Niutupuivaha pinned Baldwin’s Celine Gomes in the first period of the 225 final. The Lunas’ Sami Saribay lifts Roosevelt’s Haylee Fujioka. In the boys 106 final, Baldwin’s Coby Ravida pinned Kamehameha Kapalama’s Brant Porter in 2:59. They were tied 2-2 after one period — Ravida took a 4-2 lead early in the second period with a takedown before recording the pin. The Lunas’ Kainalu Estrella finished a family trifecta by beating Iolani’s Kaua Nishigaya 7-3 in the 132 final. He lost in the 126 state final last year. In the final match of the night, Moanalua’s Noah Wusstig beat Lahainaluna’s Kawehi Gillcoat 14-7 in the 138 boys final. 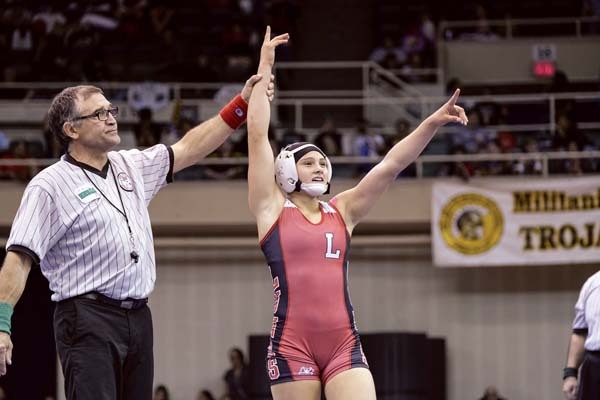 Lahainaluna’s Nanea Estrella celebrates her second state title. 1. Baldwin 157.5 points, 2. Kamehameha Kapalama 157, 3. Lahainaluna 148, 4. Moanalua 116, 5. Pearl City 111, 6. Kahuku 97, 7. Roosevelt 91, 8. Waianae 78, t9. Kaiser 63, t9. Kapolei 63. 1. Leilehua 156, 2. Kamehameha Kapalama 155, 3. Lahainaluna 148, 4. Saint Louis 140, 5. Moanalua 109.5, 6. Iolani 103.5, 7. Kapolei 85, 8. Baldwin 84.5, 9. Campbell 82, 10. Punahou 80.5. Team–1. Baldwin 157.5 points, 2. Kamehameha Kapalama 157, 3. Lahainaluna 148, 4. Moanalua 116, 5. Pearl City 111, 6. Kahuku 97, 7. Roosevelt 91, 8. Waianae 78, 9 (tie). Kaiser and Kapolei 63, 11. Leilehua 62.5, 12. Punahou 58, 13. Kealakehe 56, 14. Molokai 50, 15. Aiea 41, 16. Castle 40, 17 (tie). Campbell and Hawaii Baptist 34, 19. Damien 32, 20 (tie). KS Hawaii and Konawaena 29, 22 (tie). Keaau and Nanakuli 27, 24 (tie). Farrington and Hilo 22, 26. Kalani 18, 27. Iolani 17, 28 (tie). Mililani and University 15, 30. Maryknoll 11, 31 (tie). Lanai, McKinley and Waimea 7, 34. Radford 6, 35. Maui High 5, 36. KS Maui 4, 37 (tie). Honokaa, Kapaa, Kauai, Pahoa and Waipahu 3, 42. Hawaii Prep 1. 97 pounds–1. Xiaolin Mai, Roosevelt, 2. Alicia Mahoe, Kapolei, 3. Zoe Omura, Iolani, 4. Jazmyn Enriquez, Campbell, 5. Kaycie Tanimoto, Hawaii Baptist, 6. Brianna Funakoshi, Aiea. 102–1. Ira Navarro, Lahainaluna, 2. Kaitlin Ito, Hawaii Baptist, 3. Kennedy Javier, Mililani, 4. Madison-Joy Kogachi, Punahou, 5. Tianna Fernandez, Baldwin, 6. 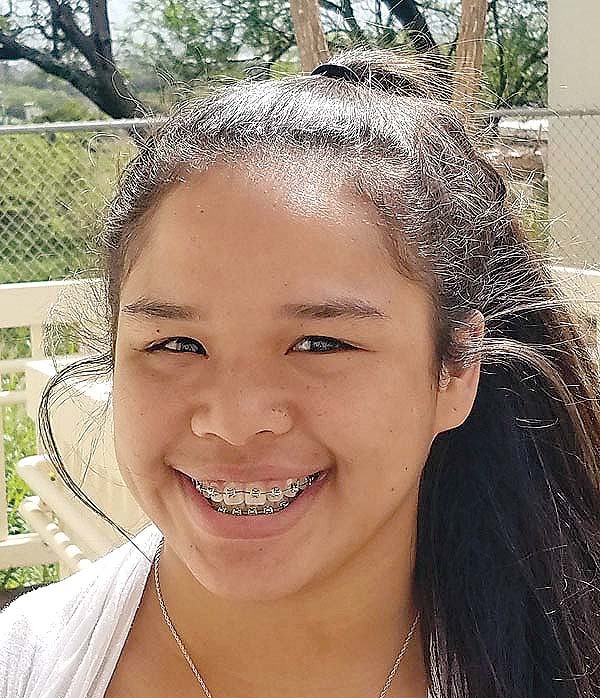 Shaina Miyasato Kawaguchi, Leilehua. 107–1. Sami Saribay, Lahainaluna, 2. Haylee Fujioka, Roosevelt, 3. Kristen Bareng, Aiea, 4. Dania Furuya, University, 5. Kalai Tengan, KS Kapalama, 6. Kayla Odo, Pearl City. 112–1. Tiare Ikei, Kaiser, 2. Ashley Gooman, KS Kapalama, 3. Rita Morales, Waianae, 4. Michaelah Vasquez, Lahainaluna, 5. Keely Oyadomari, Kapolei, 6. Alexandria Nelson, Roosevelt. 117–1. Macy Higa, Roosevelt, 2. Alana Vivas, KS Kapalama, 3. Tiare Carlson, Waianae, 4. Alexis Gibbs, Damien, 5. Mariah Spix, Leilehua, 6. Kira Borengasser, Moanalua. 122–1. Nanea Estrella, Lahainaluna, 2. Marisa Iha, Punahou, 3. Skye Realin, KS Kapalama, 4. Makana Cooper, Pearl City, 5. Amanda Higa, Moanalua, 6. Phoebe Pineda Abaya, Kalani. 127–1. Waipuilani Estrella-Beauchamp, Baldwin, 2. Alexis Nova Posiulai, KS Kapalama, 3. Alizeih Villalpando, Moanalua, 4. Chanel Hunter, Pearl City, 5. Katie Reyes, Waianae, 6. Charity Curran, Campbell. 132–1. Paige Respicio, KS Kapalama, 2. Roselani Ikei, Kaiser, 3. Kauanoe Keahi, Lahainaluna, 4. Gabrielle Perez, Moanalua, 5. Viviana Barcina, Kahuku, 6. Destinee Ader, Farrington. 138–1. Teniya Alo, Kahuku, 2. Krystal Puahala, KS Kapalama, 3. Daisha Kahoalii-Kalilikane, Molokai, 4. Ariez Igafo, Castle, 5. Waihula Kahookaulana, Keaau, 6. Rebekah Garcia, Moanalua. 145–1. Jahnea Miguel, Baldwin, 2. Sadie Antoque, Castle, 3. Tayler Pelegrino-Hayase, Lahainaluna, 4. Kaleinani Makuaole, Waianae, 5. Faith Joy Okubo, Moanalua, 6. Jennifer Tongi, Kahuku. 155–1. 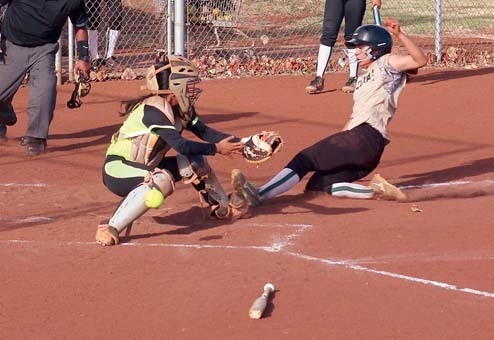 Kelani Corbett, Leilehua, 2. Nina Seoane, Pearl City, 3. Alexis Tupuola, Moanalua, 4. Leiohu Tong, KS Hawaii, 5. Malentina Holika, Hilo, 6. Katherine Heim, Kaiser. 168–1. Kapoina Bailey, Konawaena, 2. Jennie Fuamatu, Pearl City, 3. Shayna Kamaka, Baldwin, 4. Luana Kanongataa, Kahuku, 5. Alyandina Bushie, Kapolei, 6. Jaye Lee-Kaiwi, Keaau. 184–1. Roxie Umu, Kealakehe, 2. Siera Vida, Baldwin, 3. Michelle Tanuvasa, Pearl City, 4. Valerie Ramos, Damien, 5. Dylan Huddy, Maryknoll, 6. Natasha Paleafei, Farrington. 225–1. Tangiteina Niutupuivaha, Kahuku, 2. Celine Gomes, Baldwin, 3. Tenielle Ellis, Punahou, 4. Luhiehua Pedro, Molokai, 5. Shannalynne Mahoe, Nanakuli, 6. Myra Liufau, Kealakehe. Team–1. Leilehua 156, 2. Kamehameha Kapalama 155, 3. Lahainaluna 148, 4. Saint Louis 140, 5. Moanalua 109.5, 6. Iolani 103.5, 7. Kapolei 85, 8. Baldwin 84.5, 9. Campbell 82, 10. Punahou 80.5, 11. McKinley 70.5, 12. Waianae 58.5, 13. Pearl City 57, 14. Roosevelt 37, 15. Kalaheo 29, 16. Radford 28, 17. Kealakehe 27, 18. 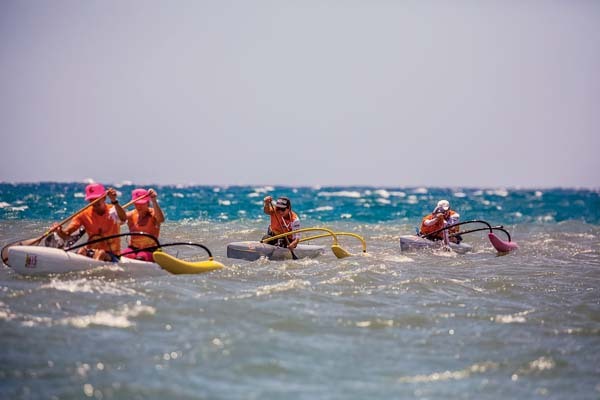 Molokai 22, Kaiser 20, 19. Kaiser 20, 20. Maui High 19, 21 (tie). Hilo and Mililani 18, 23. Lanai 17, 24. Damien 16, 25. Kahuku 15.5, 26 (tie). Nanakuli and Waiakea 15, 28. Mid-Pacific 12, 29 (tie). KS Maui and Aiea 10, 31 (tie). Castle and Kapaa 9, 33 (tie). Kailua and KS Hawaii 7, 35. Kauai 6, 36. Konawaena 5, 37 (tie). Hawaii Baptist and Honokaa 4, 39 (tie). Farrington and Hawaii Prep 3, 41. Keaau 2, 42. King Kekaulike 1. 106–1. Coby Ravida, Baldwin, 2. Brant Porter, KS Kapalama, 3. Joe Kila Faafiu, Leilehua, 4. Treston Baron, Roosevelt, 5. Cael Yasutake, Lahainaluna, 6. Nicholas Cordeiro, Waianae. 113–1. Elijah Asuncion, Moanalua, 2. Hunter Nagatani, Leilehua, 3. Elijah Kaawa, Saint Louis, 4. Kolby Inouye, Baldwin, 5. Kobby Faedonea, Kealakehe, 6. Ikua Tihada, Lahainaluna. 120–1. Kysen Terukina, KS Kapalama, 2. Brady Hoshino, Iolani, 3. Koby Chun, Kaiser, 4. Kanoa Lanoza, Lahainaluna, 5. Caleb Shimaoka, Waiakea, 6. Joy Kahilihiwa, Baldwin. 126–1. Corey Cabnanban, Saint Louis, 2. Casen Watanabe, Punahou, 3. Logan Garcia, Moanalua, 4. Zeff Dudoit, Lahainaluna, 5. Isaac Stalcup, Leilehua, 6. Weivi Zheng, Aiea. 132–1. Kainalu Estrella, Lahainaluna, 2. Kaua Nishigaya, Iolani, 3. Kaena Desantos, Leilehua, 4. Ansen Ursua, Saint Louis, 5. Elijah Diamond, Mililani, 6. Blake Tadaki, Castle. 138–1. Noah Wusstig, Moanaluna, 2. Kawehi Gillcoat, Lahainaluna, 3. Jacob Yamaguchi, Kapolei, 4. Christian Tavares, Radford, 5. Koali Nishigaya, Saint Louis, 6. Vincent Terrell, Punahou. 145–1. Zayren Terukina, Campbell, 2. Boltyn Taam, Saint Louis, 3. Chase Wisstig, Moanalua, 4. Jesse Dudoit, Lahainaluna, 5. Braden Akima, KS Kapalama, 6. Jose Jahael, Leilehua. 152–1. Branden Pagurayan, Kapolei, 2. Makana Tapia, KS Kapalama, 3. Caele Manley, Molokai, 4. Jake Angelo, Iolani, 5. Samuel Dunwell, Lanai, 6. Braeden Jensen, Kapaa. 160–1. Rysan Leong, Kalaheo, 2. Makoa Cooper, Pearl City, 3. Blaze Pascua, Iolani, 4. Mason Canonico, Punahou, 5. Kason Milarie, Hilo, 6. Keoua Kauhi, Damien. 170–1. Kaysen Takenaka, Iolani, 2. Keanu Punley, Leilehua, 3. Kasey Kikuyama, Pearl City, 4. Kachi Respicio, Campbell, 5. Salvador Gonzalez, Roosevelt, 6. Kainalu Huddy, KS Kapalama. 182–1. Brett Barefoot, Leilehua, 2. Vance Keliihoomalu, Kapolei, 3. Ty Bates, Lahainaluna, 4. Marvin Weilbacher, McKinley, 5. Cahrles Naone, Nanakuli, 6. Kalae Correa, Saint Louis. 195–1. Alize Wright, Campbell, 2. Laakea Ane, KS Kapalama, 3. Tao Tuulima, Kapolei, 4. Jonathan Aunese, Maui High, 5. Aidan Fernandez, Pearl City, 6. Damien Agao Casabar, Moanalua. 220–1. Laulii Iosefa, McKinley 2. Jonah Caminos Freitas, Leilehua, 3. Legend Matautia, Punahou, 4. Benjamin Tokanang, Baldwin, 5. Dominic Tominiko, Saint Louis, 6. 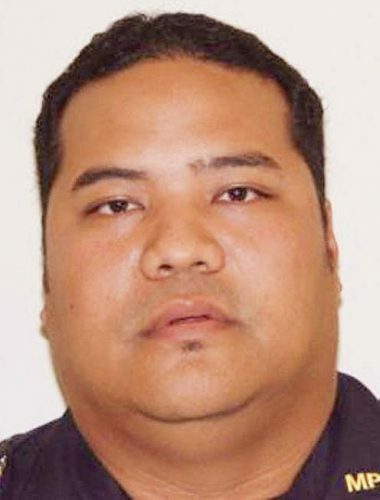 Francis Kilioni, Waianae. 285–1. Ezekiel Samuelu, McKinley, 2. Cody Bollig, KS Kapalama, 3. Gerrico Jenks, Waianae, 4. Kayson Kekahuna, Saint Louis, 5. Marcus Lombard, Kahuku, 6. Setu Vole, Kealakehe. The Lunas’ Ira Navarro wrestles Hawaii Baptist’s Kaitlin Ito. Baldwin’s Coby Ravida celebrates his win over Brant Porter of Kamehameha Kapalama.